The NEC NP-UM330WI-WK1 is 3300-lumen 0.59" LCD interactive widescreen ultra short throw projector with wall mount, MLA, eBeam interaction and ECO Mode™ technology. The projector has automatic keystone correction, cornerstone and comprehensive input/output panel. It features remote monitoring, advanced AccuBlend, AutoSense and built-in wall color correction. The NP-UM330WI-WK1 also features microphone input, closed captioning and virtual remote. The projector include a powerful 16W speaker, closed captioning, RJ-45, dual HDMI, VGA and a microphone input to amplify the presenter’s voice. It brings collaboration to both classrooms and conference rooms alike. 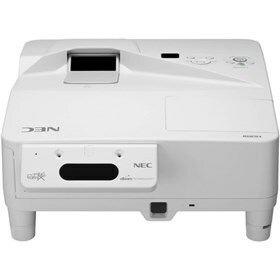 The NEC NP-UM330WI-WK1 has many exciting features for users of all types. See the NEC NP-UM330WI-WK1 gallery images above for more product views. The NEC NP-UM330WI-WK1 is sold as a Brand New Unopened Item.